With all the latest news about surveillance, we thought we’d dust off a little article from our June 19, 2003 issue, almost ten years ago. Remember those halcyon days when super christian John Ashcroft was Attorney General, the Patriot Act had just been enacted and Ari Fleischer, doing his impersonation of a Stasi agent, warned us we had to watch what we said. Yes, Big Brother had just started to trample on our civil liberties and it hasn’t gotten any better. Guantanamo Bay is still open, too. Feeling safer yet? We didn’t think so. Thanks Dubya! In his latest attempt to halt terrorism in its tracks, Attorney General John Ashcroft has announced a plan to wiretap prayers to determine possible plots against the United States. In America, the Republican Party has become the party of God and Jesus. Well, we shouldn’t be surprised because Jesus was all about supporting the rich while despising the poor. 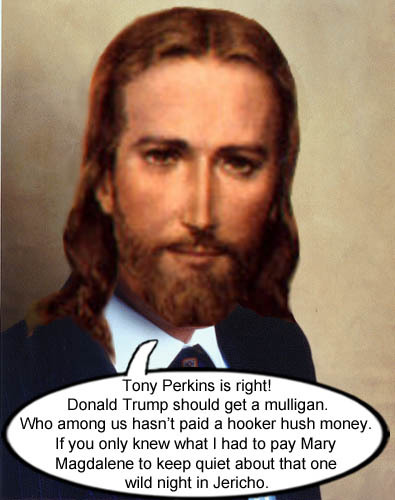 We’re sure if Jesus came back today he’d be wearing a well tailored Armani suit, driving a BMW and/or a pickup, be a member of an exclusive country club, eating caviar, drinking the finest wines and carrying a loaded gun in case any poor person would think of threatening him. And as for healthcare, he’d say, “If you can’t afford it, well that’s your fault for being poor. Why should I help you?” That’s life in a christian nation. We’re also sure that it was Jesus who steered Tropical Storm Issac away from a direct hit on Tampa and instead directed it toward other red states like Alabama, Louisiana, and Mississippi, which have many poor people, because, you know…he loves Republicans so much. 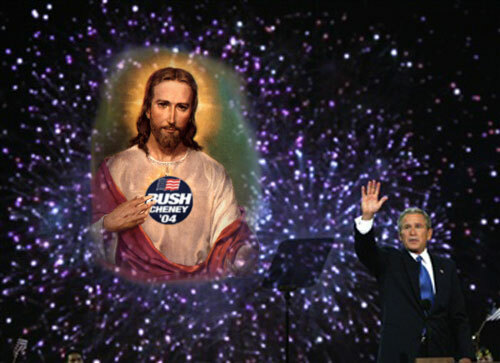 President Bush pulls some strings with the Big Guy and gets Jesus to appear to endorse his candidacy. Tim Tebow mania has gripped the sports world. All any sports pundit can talk about these days is how this young, fiery, evangelical christian is taking the football world by storm and leading the Denver Broncos on a football crusade to the promised land of Super Bowl XLVI. There was even a poll on CNN the other day asking people if they thought that Tim Tebow’s meteoric rise is due to God. Apparently, God must prefer Tom Brady and the Patriots to Mr. Tebow because the Broncos got trounced 41-23 today. We here at the Bucket think the buzz about Tebow is pretty ridiculous anyway. We’re atheists, except for Lamebeard the Pirate, who as a Pastafarian, praises the noodly appendages of the Flying Spaghetti Monster. 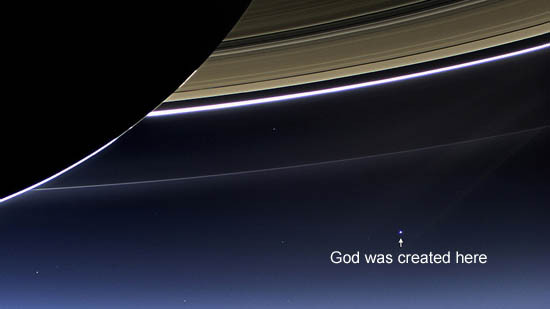 We feel that if God did exist, he probably wouldn’t care that much about who won a mostly violent, sporting event on a small rocky planet in one of millions of galaxies that exist in the universe. 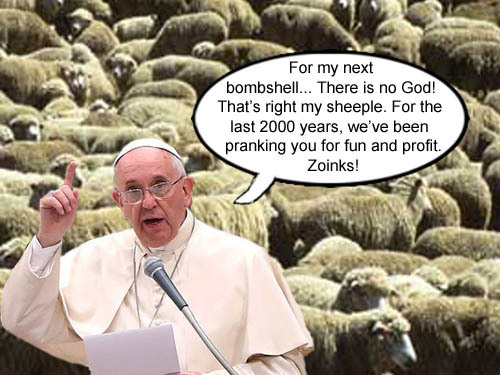 We would think an all-powerful God would have much more fun manipulating nuclear fusion to create a star, starting the celestial mechanics of a fledgling solar system or keeping black holes in line from consuming too much matter and energy. But more and more athletes these days point to the skies after they score a touchdown, make a bucket or hit a home run. We would think that these athletes should always be grateful to their God, not just on good plays. So baseball players shouldn’t just point to the sky after a home run, but also after striking out with the bases loaded, popping out in foul territory or grounding out into an inning ending double play. After all, a good baseball hitter fails seventy percent of the time. Also, if God is supposedly all around us, why point just to the sky? Why not point to a blade of grass, the dirt or a wall. Instead, on sports web sites, we get ‘action’ photos of athletes pointing to the sky instead of smacking a baseball or slam dunking a basketball or hauling in a football with an over the shoulder grab. Hmmm…Methinks there might some christians in professional athletics. Here’s a photo-toon from our June 26, 2007 edition which offers another possible explanation for athletes pointing to the sky. 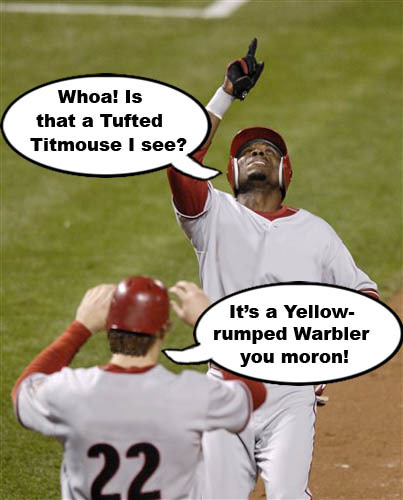 Baseball players have been pointing to the sky frequently in recent years showing off their obvious love of bird watching.